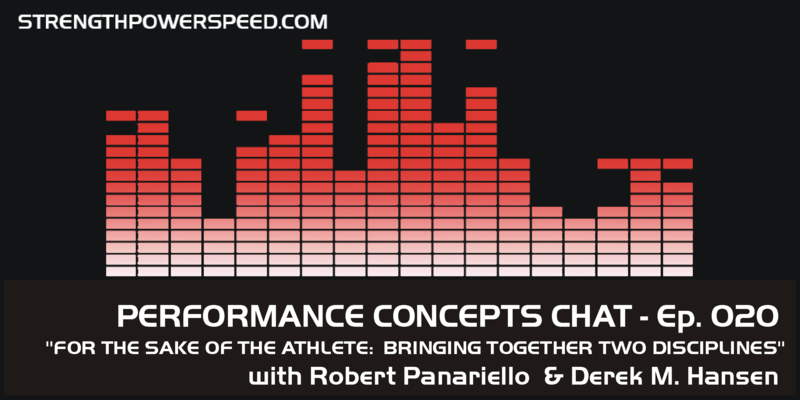 In this episode of the Performance Concepts Chat, we have the pleasure and honour of speaking with Robert Panariello of Professional PT on various topics relating to athlete performance, physical preparation and rehabilitation. In many ways, training and rehabilitation are so interconnected and cannot be easily separated. Strength and Conditioning Coaches are often training athletes that are recovering from acute injuries or dealing with chronic injuries. Physical therapists and athletic trainers often prescribe exercises that may be similar to conventional training practices. Where do the two professions overlap and where do people stray outside of their scope of work? For this reason, both sides can find it difficult to work together effectively. But shouldn’t we be working close together – all egos aside – for the sake of the athlete? Rob Panariello has had the luxury of living both sides of the equation, having worked as a college and pro strength coach, but also having had a long career as a physical therapist, and building a successful practice and business that serves thousands of athletes and general population clients daily. His relationships with top coaches and surgeons is unparalleled in the sport performance field, and he has a wealth of knowledge to pass on to both young and old sport performance and rehab professionals. You can find out more about Professional PT at http://www.professionalPT.com and you can contact Rob Panariello via email at rpanariello@professionalpt.com.